Copyediting has become an integral part of marketing communication today. Content put out by your organization is consumed by people across the globe. Most organizations today have an in-house editor or communications team working on polishing their copy and setting up a unified voice for their brand. Back in July, we introduced Review mode in Writer, giving more room for writer-editor discussions to happen within a document. You and your editor can work together on a piece of copy, making changes and adding comments. The author can stay in control of these changes using our Track Changes option. As organizations grow, the number of documents being circulated increases. You get more editors, more reviewing, and more changes to consider. We’ve come up with some unique tools that aren’t available in other online word processors to make editing less intrusive for authors and more fun for editors. 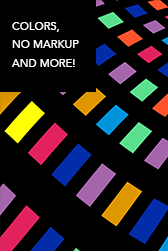 Introducing an all-new No Markup mode. And now something for the editors. Ever wondered why teachers traditionally use red pens for grading papers? If you went to school in India, you might recall school principals signing off circulars in nothing but green ink. We learn to associate colors with certain people, and then we know who marked what the moment we see the color. Imagine, as an editor, being that recognizable. Now you can personalize your color in Writer and let your colleagues identify your edits even before they see your name. Any changes you make will appear in the color you’ve chosen for yourself, instead of the randomly-assigned colors you’ve used until now. Your cursor, and the edits you make will appear in this color across documents. Go ahead and reserve your color! But you might want to hurry if you’re hoping to grab your favorite color before one of your teammates does. ???? There’s more to this update. Here’s a complete list of what we’re announcing today. Whatever you’re creating, remember: we can write and rewrite, but we can never be our own editors. Our own writing is too close to our hearts for us to make effective changes to it. We all need critics! We also need editors who can help us kill our darlings. Those markups make our writing stronger — so invite a reviewer to look at your latest piece and see what happens. No red pen required. New to Writer? Writer is a powerful collaboration platform, built on a clean and crisp writing space. Add people to your document. Talk it over using comments and live chat. Track changes they make. All real-time, all free!